Two hikers on a llama hike enjoy the view from the bluffs above the upper Animas Valley. Three "Hike, Lunch and Wine with a Llama" loop hikes are planned this summer originating at Durango Mountain Resort as part of the San Juan EdVentures Series. Well, the warm weather took its time getting here, but it has arrived at last. San Juan Mountains Association, in partnership with San Juan Public Lands, has great summer programs lined up that will get you out and about enjoying our public lands. SJMA has a series of seminars and hikes scheduled called the San Juan EdVentures Series. You can come to one program in the series or all of them - the more you attend, the more you'll know. Many of our programs are led by incredibly knowledgeable and generous volunteers. Be sure to thank them when you come out. We have several opportunities this summer to learn about wildflowers. The first is the morning of June 19 at the Dolores Public Lands Office. Al Schneider with the Four Corners Native Plant Society will present a wildflower identification and photography workshop - and stick around that evening for some astronomy at the McPhee Overlook with Bill Nietveld, an astronomy instructor with Southwest Colorado Community College. We'll have a hike focusing on wildflowers and ecology at Coal Bank Pass on Aug. 13, and another as part of "Hikes for Grownups" on July 10 at Lizard Head Pass. To learn more about plants - medicinal, edible and floral - come to our hikes on July 13 and July 31. The July 13 hike will be led by Katrina Blair with Turtle Lake Refuge and will take place along the Colorado Trail at Junction Creek. Calida Maischoss will lead the July 31 hike, which will cover plants found at higher elevations. To register, call Calida at 759-9287. We're hoping for more rain this summer than we had last year, which would bring us lots of mushrooms. If all goes well, we'll have a great mushroom-hunting hike Aug. 20 led by Page Lindsey, a retired professor from Fort Lewis College. If rocks are your thing, come to our rock-talk hike on Sept. 29. Jason Hooten with the Southern Ute Indian Tribe's geology department will take hikers into Horse Gulch and on to Raider Ridge. Learning about the San Juans wouldn't be complete without the human history. On June 23, Duane Smith with Fort Lewis College will present "Ho for the San Juans!" - a lecture that is sure to be lively, informative and interesting. You will come away knowing more about people of the San Juans than you did before. We are excited to offer a new program this summer: a backpacking trip with our very own MK Thompson. Start your preparation for this trip by attending Will and Jan Reitveld presentation about backpacking light on July 27 at the Public Lands Center. A pretrip meeting will be held Aug. 18. The overnight backpacking trip with MK will take place Aug. 28, possibly on the beautiful Pine River Trail. Whew! Are you tired yet? Well, we have even more to offer. In addition to the Lizard Head wildflowers hike, the Hikes for Grownups program has two others - June 26 starting at Target Tree Campground, and Aug. 14 starting at Transfer Campground. These hikes are fun, laid-back excursions for people who want to see new areas, meet new people and learn about the environment. To register, call Karen Dickson at 394-4862. We also are partnering again with Durango Mountain Resort on two programs. The first is our free, guided nature hikes every Tuesday and Saturday throughout the summer, starting June 19. These are great opportunities to get to know the mountains in your own backyard and bring your out-of-town guests. You'll learn about wildflowers, trees, animal tracks and the geology of the San Juans. Meet outside the ticket office at 9:45 a.m.; the two-hour hike begins at 10 a.m. Preregistration is not required. 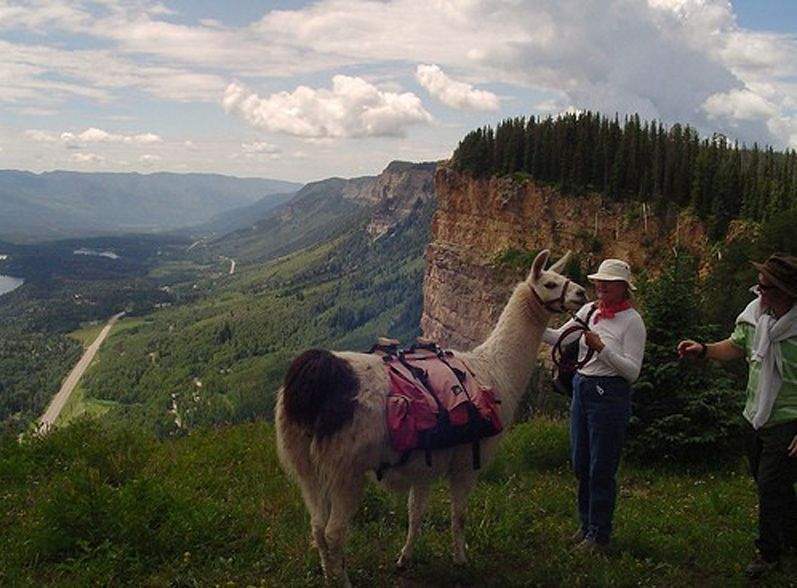 If you want something a little more involved, come on one of our guided "Hike, Lunch and Wine with a Llama" excursions. These will take place June 27, July 25 and Aug. 15. Llamas will carry your lunch, wine and cheese, and you'll enjoy a beautiful five-mile loop starting at DMR and going into the national forest. This hike is moderately strenuous and costs $25 per person. For toddlers and preschoolers, we're offering Little Legs Adventures on several Fridays. We'll take the kids (with parents or leaders) out for an hour of adventure in nature in the Cortez, Dolores and Mancos areas. If you have family coming in from out of town or a group of local people you want to hike with, let us know and, schedule-permitting, we can take your group on a guided hike. For more information, visit our website, www.sjma.org. The site is frequently updated with new programs and information. To inquire about or register for any of the above programs, call 385-1256 or e-mail gabi@sjma.org. All programs are supported by San Juan Public Lands. Gabi Morey is the education outreach director with the San Juan Mountains Association.